On February 1, 2016, the new UW Health Fort Atkinson clinic opened its doors to patients. 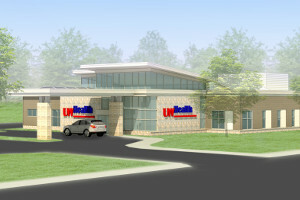 A rendering of the new UW Health Fort Atkinson clinic. The new clinic offers the latest in design concepts and supports new models of care. For example, patients can check in at a kiosk and self-room for appointments, which promotes efficiency. Physicians and clinical staff are co-located “backstage” from the exam rooms, which facilitates care team coordination. In addition, an automated call system supports enhanced communication between the check-in and clinical care team members. Nurses work on chronic disease management and outreach in a designated space. The entire care team is in close proximity to each other to manage their population of patients. The new clinic is located at 1620 Mehta Lane in Fort Atkinson, Wisconsin.